Now, read this brilliant article on compatibility according to the Jyotisha Hindu astrology system. In Vedic Astrology, relationship compatibility is based upon the Moon and Nakshatras. The Moon is the mind and feelings of the individual. It is the Jiva, the idea of separate existence and the Ahamkara, the ego. In essence, the Moon is our very identity as opposed to the Western Astrological view that the Sun represents the ego. In Vedic Astrology, the Sun is the Soul, because the Sun is constant. It never stops shining. The Moon, however, takes the light of the Sun, as the mind takes the light of the soul, and waxes and wanes. In other words, the Moon CHANGES. The Sun does not. Therefore, the most appropriate planet to represent the individual is the Moon. The Vedic compatibility techniques are very simple, yet very profound. Since they are based upon the Nakshatras, these techniques are exceptionally ancient and come directly from the Rishis. Many will say that these techniques are outdated and do not work in modern society because relationships between men and women have changed enormously. While the cultural norms of relationships have changed, the dynamic of two people interacting with each other have not, and these techniques apply just as well today as they did thousands of years ago. What is a relationship? It is two people relating to each other and the needs and emotions of this exchange never change. As you will see as you read further, these techniques are so insightful into the human psyche, their profoundness has not diminished in the least. A relationship consists of two people relating and for that to happen there must always be masculine energy and feminine energy, whether it is a man and a woman, two women, two men, a teacher and student or a parent and child. There is ALWAYS a male/female dynamic happening. When male/female dynamic is stated, please throw out all concepts of what male/female is. Masculine energy is dynamic, initiating, steadfast energy and feminine energy is receptive, accommodating, changeable energy. Masculine energy wants to be loved for what it does and when it does good, it feels good. Feminine energy wants to be loved for what it is, and when it feels good, it does good. An example would be when one person talks, another must listen, otherwise you have two people talking at the same time, in which case they are not relating, or you have neither one talking, in which case there is no relationship. This is not to say that in a heterosexual couple, the woman is always receptive and the man is always dynamic. I am just explaining what masculine and feminine energy are and how they are always at play in creation and in relationships. Laura Barat is a full-time practicing Vedic Astrologer in the Rocky Mountains of Colorado. She is a graduate of the American College of Vedic Astrology and a regional teacher for Dirah Academy International. She has studied under the renowned Vedic Astrologer, Ernst Wilhelm. You can compare your nakshatra with your sweetheart’s over here. -waiting for netflix to enjoy the view, but not the movie. -I would not see the movie. Hardly liked the book. -the book was so bad i can’t imagine wasting my time or money on the movie. -On my list, but not urgent. -it was aight. i gave it away. -really good. will check out the other entries. • Soy will give you breast cancer. • Soy formula is dangerous to babies. • Genetically modified soy foods may modify you. • Soy foods block your thyroid function. • Soy prevents the absorption of minerals and interferes with digestion. • Tofu causes Alzheimer’s disease. If you want an excellent, unbiased, scientifically sound review of all the relevant human data on soy, Dr. Hyman recommends reading the 100-page report from the Agency for HealthCare Research and Quality entitled, The Effects of Soy on Health Outcomes, which reviewed thousands of studies based on rigorous criteria for scientific validity. Its conclusion was this: There is no evidence of significant benefit or harm based on the quality of evidence that exists today. HAFNARFJORDUR, Iceland – Do elves exist? Like many Icelanders, Hildur Hakonardottir considers the question to be more complicated than it appears. 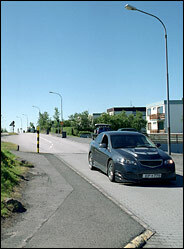 In Kopavogur, a section of road was narrowed to accommodate elves thought to live in the nearby rock. Pall Stefansson for The New York Times. Hypothetically speaking, what does she think elves look like? If you happen to find yourself around Mysore this weekend, why not sign up for a good old fashion yoga competition? According to the Times of India, the Vishwa Samskruti Yoga Kendra has organized the event for people of all ages in order to promote the health benefits of yoga. When you go to the gym, do you wash your hands before and after using the equipment? Bring your own regularly cleaned mat for floor exercises? Shower with antibacterial soap and put on clean clothes immediately after your workout? Use only your own towels, razors, bar soap, water bottles? If you answered “no” to any of the above, you could wind up with one of the many skin infections that can spread like wildfire in athletic settings. In June, the National Athletic Trainers’ Association, known as N.A.T.A., issued a position paper on the causes, prevention and treatment of skin diseases in athletes that could just as well apply to anyone who works out in a communal setting, be it a school, commercial gym or Y. The authors pointed out that “skin infections in athletes are extremely common” and account for more than half the outbreaks of infectious diseases that occur among participants in competitive sports. And if you think skin problems are minor, consider what happened to Kyle Frey, a 21-year-old junior and competitive wrestler at Drexel University in Philadelphia. Mr. Frey noticed a pimple on his arm last winter but thought little of it. He competed in a match on a Saturday, but by the next morning the pimple had grown to the size of his biceps and had become very painful. His athletic trainer sent him straight to the emergency room, where the lesion was lanced and cultured. Two days later, he learned he had MRSA, the potentially deadly staphylococcus infection that is resistant to most antibiotics. If it could happen to Mr. Frey, who said he has always been health-conscious in the gym and careful about not sharing his belongings, it could happen to you. Recreational athletes as well as participants in organized sports are prone to fungal, viral and bacterial skin infections. Sweat, abrasion and direct or indirect contact with the lesions and secretions of others combine to make every athlete’s skin vulnerable to a host of problems. While MRSA may be the most serious skin infection, athlete’s foot, jock itch, boils, impetigo, herpes simplex and ringworm, among others, are not exactly fun or attractive.